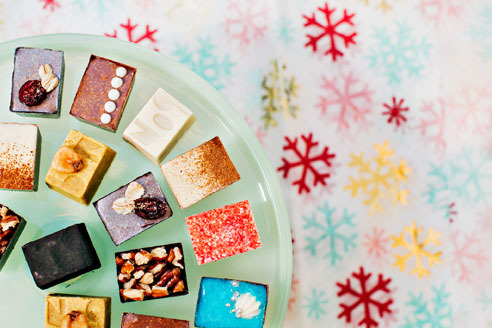 Crafting funky chocolates in a Rosie the Riveter bandanna and coveralls, Alexandra Clark of Bon Bon Bon gives froufrou candy-making a Detroit-style update. Here’s how. She plays nice. And naughty. Alex adored her high school job at a scoop shop. “The thing I really loved about ice cream is what I love about chocolate,” she says. “You get to be with people when they’re being naughty. Not forbidden, not risqué, but a little naughty." She’s no Forrest Gump. With a box of Alexandra Clark chocolates, you always know what you’re gonna get. Her $3 bonbons are thin chocolate shells (boxes themselves, really) with no top, so the filling is exposed. The design is a metaphor: “We are an open and honest business.” Rather than convey an air of finnicky perfection, her staff shares kitchen mishaps on Instagram, to the glee of adoring fans.